Experts suggest that each home have a basic medical supply that is unique to your family’s needs. Medical emergencies can occur at the drop of a hat, and having the necessary supplies can mean the difference between life and death. When an emergency situation arises, one must act calming and decisively. Experts suggest that each home have a basic medical supply that is unique to your family’s needs. We all have our fair share of band-aids and antibiotic ointment, but do you have medical supplies that can stop dehydration or bleeding, or diarrhea? In the event of a major disaster, such as a hurricane or earthquake, if someone in the home is injured, emergency responders cannot always get to the injured victims in time. Therefore, having necessary medical supplies in the home could save someone’s life if they need immediate medical assistance. 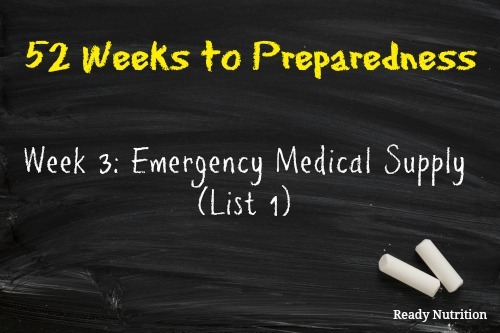 Having pre-assembled medical packs for specific medical emergencies can save precious time. In the case of a severe injury where there is a lot of blood loss, there must be supplies on hand that can stop bleeding, reduce the pain, and calm the patient if necessary. Not only are supplies important, though. Having a family member confident to provide this type of medical care is a must in a survival situation. Taking medical courses would be very beneficial in preparing for this type of emergency. The Fire Department, American Red Cross or Medical Centers are local resources that offer classes to assist in medical emergencies. To further prepare, find websites online that deal with first aid care and go through each injury to see what medical instruments and items are needed. Moreover, you should have a good understanding of how to properly store medications in order to keep them ready for emergencies. Make a list for supplies that can be added to your disaster medical supplies. Take advantage of discount stores and sales that may be going on in the stores so you can stock up. Here are some tips for purchasing medical supplies on a budget. As well, don’t forget about the Dollar Store and items found in the home that can be improvised for medical care. Keep an assortment of emergency medicine references on hand. This ebook is a free download: First Aid Full Manual. In addition, The Survival Medicine Handbook by Dr. Bones and Nurse Amy is a wonderful resource for your preparedness library. Keep in mind that medicines can break down and spoil if they are subject to natural elements such as moisture, temperature fluctuations and exposure to light. Did you know that aspirin has a tendency to begin breaking down when it is exposed to a slight amount of moisture? Find an area in the home that has easy access and preferably located in a cool, dark area that is out of children’s reach. Also, check expiration dates periodically to ensure the medicines are still good to use. The below list of items will serve as a beginning foundation for future medical supply lists. As a Paramedic who works in remote/austere/maritime and hostile locations it is a good idea to have a medical bug out bag..
Tourniquets, not just for serious bleeding but can be used to control bleeding, you can cut of the blood flow to a wounded area, clean it out (Debride) then dress. Military style trauma dressings, 2, 4, 6, 8 inch. EMT Scissors, Tweezers, Cloth scissors, hemostats, scalpel. antacids may be a waste of space and money if you have stocked the baking soda (mentioned in a previous week). 1/2 tsp. in 4 oz. water relieves heartburn, upset stomach, etc. full directions on the back of the arm and hammer box. make sure to follow directions for maximum use per day. i’ve done this myself and it works. great to have tums tablets though, for travel or lack of water, so i guess it’s up to each family to decide what to stock up on. Very interesting website, thanks for all the helpful info. As a former EMT, I would also recommend having a pre-packaged suture kit on hand. You may not know how to use it, but you can probably find someone who can. In an emergency, with a decent first aid book to guide you (especially if you practice a bit) you would be surprised what you can do. At the very least, it would be an extraordinary item to barter with. You can put all this in a fishing tackle box, clearly mark it First Aid and replace items regularly. wonderful, informative website!! I live in a coastal NC therefore, we always have to be prepared for hurricanes. I had a hurricane tote that was ready to go, but getting older/bad shoulder, cant life to move. So, downsized the tote to a couple of backpacks, downsized the contents also. (I had enough to weather 1 week for hubby/pets)! ONE THING TO ALWAYS HAVE, anywhere (purse, car, house etc) is BACH RESCUE REMEDY – cream or liquid. It is made from flowers, can be used for pets, children, no side effects, no messing with medications, wont harm in anyway. It is used on lots of EMT/Rescue. They use it as a “trauma” remedy for people/pets who are in a traumatic situation – fire, accident, etc. This stuff is great for calming, no drugs, liquid can be put on tongue, wrists, anywhere on body; on animals, on the inside tip of their ears. It calms, you dont feel anything but a calm feeling, helps when traveling, anything. I have used this stuff when going to the dentist – no fears!!! Great stuff. I was wondering if anyone could refer me to a good first aid book? I want to have a guide to emergency first aid when we can’t get help, things like stitches and wound care.